1. Mix the beetroot and cabbage together in a large bowl. 2. Blend together the mayonnaise, horseradish, mustard, fennel seeds and milk then season well. Stir into the beetroot and cabbage and mix well. Great served with leftover turkey and a leafy salad, too. 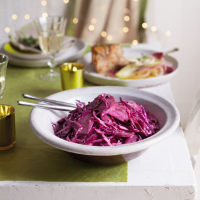 Try using green cabbage instead of red, or vacuum packed cooked beetroot for speed.